SETTING: In New England, sometime in the second half of the nineteenth century, Ren—a one-handed orphan boy named after the initials sewn in his collar—has been deposited as a newborn on the steps of Saint Anthony, a catholic monastery that functions as an orphanage for boys. From this orphanage local people, and sometimes strangers, come and pick up a child either for help on a farm or claiming to be a relative. The monks acquiesce in this since the boys are otherwise conscripted into the army when discharged from the orphanage. 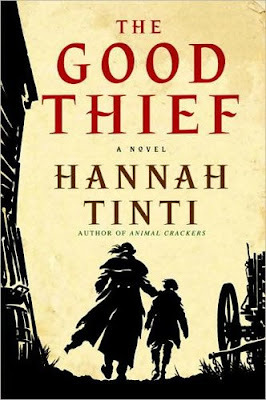 FORMAT/INFO: “The Good Thief” stands at 327 pages divided over three parts, thirty-five numbered chapters, and an epilogue. The story is narrated in the third-person present tense and follows the character of Ren. The ending is excellent and fitting, bringing together all of the novel’s main threads. 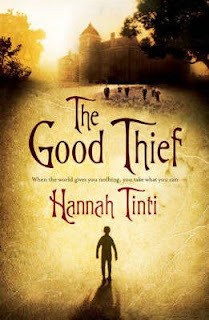 July 10, 2008 marked the UK Hardcover (see inset) publication of “The Good Thief” via Headline Review. The US version was released on August 26, 2008 via The Dial Press. Cover illustration was provided by David Frankland. One of the most compelling characters in the book is Benjamin Nab whose stories about bandits, dead parents, sailing to exotic places, encountering fabulous animals, searching for his missing younger brother across the years, and many other fascinating adventures are undeniably charming. Of course, the reality is a bit disappointing as Benjamin is a con man and wanted by the government. Plot-wise, a one-handed boy opens many doors to an expert trickster with a golden tongue so it’s not long before Ren is sucked deeper and deeper into the shady world—carnival tricks and nightly grave robberies—of Benjamin Nab and his associates, forcing the boy to grow up fast and make unexpected friends.